With the M life Rewards Mastercard, you can turn everyday purchases into elevated experiences by earning M life Rewards Points that can be redeemed for FREEPLAY, and Express Comps for use on rooms, dining and entertainment. Sorry, something went wrong and we are unable to submit your information to the bank. Please try again later. You must be at least 21 years old and an M life Rewards member in good standing to be eligible for the M life Rewards Mastercard. You must be 18 years old to be eligible for a credit card. To apply for a First National Bank of Omaha Platinum Edition® Mastercard without rewards, please visit FirstBankcard.com/fnbomnr. 10% Bonus on Points and Express Comps for your gaming spend. Q: When do I earn Points and Tier Credits for my spend on the M life Rewards Mastercard? A: Points and Tier Credits from your M life Rewards Mastercard spend are earned at the close of your monthly billing cycle. It may take up to 7 - 10 days from your billing cycle close date for Points and Tier Credits to be applied to your M life Rewards account. Q: Do I have to be a US resident to apply for the M life Rewards Mastercard? A: Yes, only M life Rewards members with a US resident address are eligible to apply. Q: Do I only earn Points and Tier Credits at M life Rewards Destinations3? A: Actually, you earn both Points and Tier Credits everywhere you make purchases with your M life Rewards Mastercard. Use it for everyday purchases and on your next visit to your favorite M life Rewards destination. Q: How can using my M life Rewards Mastercard help me get back to my favorite M life Rewards destination even faster? A: You earn rewards everywhere you make purchases with your M life Rewards Mastercard. For example, with each $1 spent on gas or at the supermarket you will earn 2 Points and 2 Tier Credits1. So now you can turn refueling at the pump into a relaxing trip at the spa. Q: How quickly will I be upgraded to Pearl Status after I'm approved for the M life Rewards Mastercard3? A: It may take 7-10 days for the Pearl Status upgrade to be reflected on your M life Rewards account. Q: What can I use my M life Rewards Points for? A: Points can be redeemed for FREEPLAY and Express Comps - which can be used for rooms, dining and shows. Continue to use your M life Rewards Mastercard, and your Points won't expire1. Q: What type of bonus do I receive for spending $1,000 in my first three billing cycles? A: You will receive 10,000 bonus Points after spending $1,000 in the first three billing cycles. Bonus Tier Credits are NOT earned for spending $1,000 in the first three billing cycles1. 1 See the Credit Card Rewards Terms and Conditions in the Summary of Credit Terms for details. For Pearl and higher Tiers, Points do not expire as long as you have activity (including use of your M life Rewards Mastercard) within a 12-month period. MGM Resorts International owns the M life Rewards program. 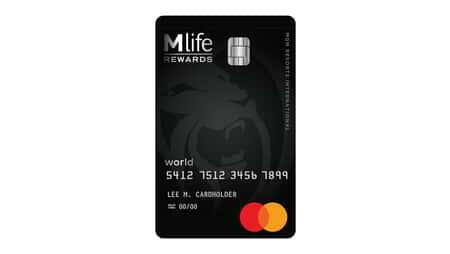 Please visit mlife.com or call 866.789.6716 for M life Rewards program rules, including earning, expiration or forfeiture of Points and Tier Credits. Percentage Rates (APRs), fees and other costs, please see the Summary of Credit Terms. 3 M life Rewards Tier will remain at least Pearl Status as long as your account remains open and in good standing. Cards are issued by First Bankcard®, a division of First National Bank of Omaha, pursuant to a license from Mastercard International Incorporated. Mastercard and the Mastercard Brand Mark are registered trademarks of Mastercard International Incorporated.